The ancient Greek period is the last time that Greece had some semblance of political independence. It therefore offers insights into how Greek geography has crafted Greek strategy. Throughout the history of Greece, its geography has been both a blessing and a curse, a blessing because it allowed Greece to dominate the “known Western world” for a good portion of Europe’s ancient history due to a combination of sea access and rugged topography. In the ancient era, these were perfect conditions for a maritime city-state culture oriented toward commerce and one that was difficult to dislodge by more powerful land-based opponents. This geography incubated the West’s first advanced civilization (Athens) and produced its first empire (ancient Macedon). However, Greek geography is also a curse because it is isolated on the very tip of the rugged and practically impassable Balkan Peninsula, forcing it to rely on the Mediterranean Sea for trade and communication. None of the Greek cities had much of a hinterland. These small coastal enclaves were easily defendable, but they were not easily unified, nor could they become large or rich due to a dearth of local resources. This has been a key disadvantage for Greece, which has had to vie with more powerful civilizations throughout its history, particularly those based on the Sea of Marmara in the east and the Po, Tiber and Arno valleys of the Apennine Peninsula to the west. Greece is located in southeastern Europe on the southernmost portion of the Balkan Peninsula, an extremely mountainous peninsula extending south from the fertile Pannonian plain. The Greek mainland culminates in what was once the Peloponnesian Peninsula and is now a similarly rugged island separated by the man-made Corinth Canal. Greek mountains are characterized by steep cliffs, deep gorges and jagged peaks. The average terrain altitude of Greece is twice that of Germany and comparable to the Alpine country of Slovenia. The Greek coastline is also very mountainous with many cliffs rising right out of the sea. Greece is easily recognizable on a map by its multitude of islands, about 6,000 in total. Hence, Greece consists of not only the peninsular mainland but almost all of the Aegean Sea, which is bounded by the Dodecanese Islands (of which Rhodes is the largest) in the east, off the coast of Anatolia, and Crete in the south. Greece also includes the Ionian Islands (of which Corfu is the largest) in the west and thousands of islands in the middle of the Aegean. The combination of islands and rugged peninsular coastline gives Greece the 10th longest coastline in the world, longer than those of Italy, the United Kingdom and Mexico. 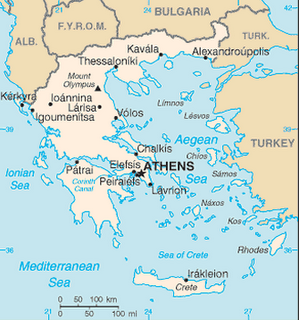 Mountainous barriers in the north and the northeast mean that the Greek peninsula is largely insulated from mainland Europe. Throughout its history, Greece has parlayed its natural borders and jagged terrain into a defensive advantage. Invasion forces that managed to make a landing on one of the few Greek plains were immediately met by high-rising cliffs hugging the coastline and well-entrenched Greek defenders blocking the path forward. The famous battle of Thermopylae is the best example, when a force of 300 Spartans and another 1,000 or so Greeks challenged a Persian force numbering in the hundreds of thousands. The Ottomans fared better than the Persians in that they actually managed to conquer Greece, but they ruled little of Greece’s vast mountainous interior, where roving bands of Greek brigands — called khlepts — blocked key mountain passes and ravines and entered Greek lore as heroes. To this day, its rugged topography gives Greece a regionalized character that makes effective, centralized control practically impossible. Everything from delivering mail to collecting taxes — the latter being a key factor in Greece’s ongoing debt crisis — becomes a challenge. With rugged terrain come defensive benefits, but also two geographic handicaps. First, Greece is largely devoid of any land-based transport routes to mainland Europe. The only two links between Greece and Europe are the Axios and Strimonas rivers, both which drain into the Aegean in Greek Macedonia. The Axios (also called the Vardar River) is key because it connects to the Morava River in Central Serbia and thus forms an Axios-Morava-Danube transportation corridor. While no part of the river is actually navigable, one can travel up the Balkan Peninsula on valley roads. The Strimonas takes one from Greek Macedonia to Sofia, Bulgaria’s capital, and from there via the Iskar River through the Balkan Mountains to the Danubian plain of present-day Romania. Neither of these valleys is an ideal transportation route, however, since each forces the Greeks to depend on their Balkan neighbors to the north for links to Europe, historically an unenviable position for Greece. The second handicap for Greece is that its high mountains and jagged coastline leave very little room for fertile valleys and plains, which are necessary for supporting large population centers. Greece has many rivers and streams that are formed in its mountains, but because of the extreme slope of most hills, most of these waterways create narrow valleys, gorges or ravines in the interior of the peninsula. This terrain is conducive to sheep- and goat-herding but not to large-scale agriculture. This does not mean that there is no room for crops to grow. Indeed, rivers meeting the Aegean and Ionian seas carve short valleys that open to the coast where the sea breeze creates excellent conditions for agriculture. The problem is that, other than in Thessaly and Greek Macedonia, most of these valleys are limited in area. This explains to an extent why Greece, throughout its history, has retained a regionalized character, with each river estuary providing sufficient food production for literally one city-state and with jagged mountain peaks greatly complicating overland communication among these population centers. The only place where this is not the case is in Greek Macedonia — the location of present-day Thessaloniki — where a relatively large agricultural area provided for the West’s first true empire, led by Alexander the Great. Lack of large areas of arable land combined with poor overland transportation also complicate capital formation. Each river valley can supply its one regional center with food and sufficient capital for one trading port, but this only reinforces Greece’s regionalized mentality. From the perspective of each region, there is no reason why it should supply the little capital it generates to a central government when it could just as well use that capital to develop a naval capability of its own, crucial for bringing in food via the Aegean. This creates a situation where the whole suffers from a lack of coordination and capital generation while substantial resources are spent on dozens of independent maritime regions, a situation best illustrated by ancient Greek city-states, most of which had independent navies. Considering that developing a competent navy is one of the costliest of state endeavors, one can imagine how such a regionalized approach to naval development constrained an already capital-poor Greece. The lack of capital generation is therefore the most serious implication of Greek geography. Situated as far from global flows of capital as any European country that considers itself part of the West, Greece finds itself surrounded by sheltered ports, most of which are protected by mountains and cliffs that drop off into the sea. This affords Greece little room for population growth, and contributes to its inability to produce much domestic capital. This, combined with the regionalized approach to political authority encouraged by mountainous geography, has made Greece a country that has been inefficiently distributing what little capital it has had for millennia. Countries that have low capital growth and considerable infrastructural costs usually tend to develop a very uneven distribution of wealth. The reason is simple: Those who have access to capital get to build and control vital infrastructure and thereby make the decisions both in public and working life. In countries that have to import capital, this becomes even more pronounced, since those who control industries and businesses that bring in foreign cash have more control than those who control fixed infrastructure, which can always be nationalized (industries and businesses can move elsewhere if threatened with nationalization). When such uneven distribution of wealth is entrenched in a society, a serious labor-capital (or, in the European context, a left-right) split emerges. This is why Greece is politically similar to Latin American countries, which face the same infrastructural and capital problems, right down to periods of military rule and an ongoing and vicious labor-capital split. Despite the limitations on its capital generation, Greece has no alternative but to create an expensive defensive capability that allows it to control the Aegean Sea. Put simply, the core of Greece is neither the breadbaskets of Thessaly and Greek Macedonia, nor the Athens-Piraeus metropolitan area, where around half of the population lives. The core of Greece is the Aegean Sea — the actual water, not the coastland — which allows these three critical areas of Greece to be connected for trade, defense and communication. Control of the Aegean also gives Greece the additional benefit of influencing trade between the Black Sea and the Mediterranean. Without control of the Aegean, there simply is no Greece. To control the Aegean and Cretan seas, Greece has to control two key islands in its archipelago, Rhodes and Crete, as well as the Dodecanese archipelago. With those islands under its control, the Aegean and Cretan seas truly become Greek “lakes.” The other island of importance to Athens is Corfu, which gives Greece an anchor in the Otranto Strait and thus an awareness of threats emerging from the Adriatic. Anything beyond the main Aegean islands and Corfu is not within the scope of Greece’s basic national security interests and can only be gained by the projection of power. In this strategic context, Cyprus becomes important as a way to distract and flank Turkey and break its communications with the Levant and Egypt, traditional spheres of Istanbul’s (and later Ankara’s) influence. Sicily is also within the range of Greek power projection, and at the height of Greece’s power in ancient times, Sicily was frequently colonized by Greek powers. Controlling Sicily gives Greece the key gateway into the western Mediterranean and brackets off the entire eastern half of the Mediterranean for itself. But neither is essential, and projecting Greek power toward either Sicily or Cyprus in the modern day is extremely taxing, although Greece has attempted it with Cyprus, an attempt that led to a near disastrous military confrontation with neighboring Turkey. The cost of controlling just the Aegean Sea and its multitude of islands cannot be overstated. Aside from the monumental expense of maintaining a navy, Greece has the additional problem of having to compete with Turkey, which is still considered an existential threat for Greece. In the modern context, this has also underscored the importance of air superiority over the Aegean. The Greek air force prides itself on maintaining a large and advanced fleet of front-line combat aircraft well in excess of the country’s economic means, and many observers believe that their fighter pilots are among the best and most experienced in Europe — and beyond (they regularly tangle with Turkish pilots over the Aegean). But maintaining, owning and training a superior air force means that Greece was spending more than 6 percent of its gross domestic product (GDP) on defense, twice what other European countries were spending, just prior to the onset of the current financial crisis (it has since pledged to reduce it significantly, to below 3 percent). With no indigenous capital generation of its own, Greece has been forced to import capital from abroad to maintain such an advanced military. This is in addition to a generous social welfare system and considerable infrastructural needs created by its rugged geography. The result is the ongoing debt crisis that is threatening not only to collapse Greece but also to take the rest of the eurozone with it. The Greek budget deficit reached 13.6 percent of GDP in 2009, and government debt is approaching 150 percent of GDP. Greece has not always been a fiscal mess. It has, in fact, been everything from a global superpower to a moderately wealthy European state to a political and economic backwater. To understand how this isolated, capital-poor country has devolved, we need to look beyond physical geography and contemplate the political geography of the region in which Greece has found itself throughout history. Ancient Greece gave the Western world its first culture and philosophy. It also gave birth to the study of geopolitics with Thucydides’ History of the Peloponnesian War, which is considered to be a seminal work on international relations. It is an injustice to give the ancient Greek period a quick overview, since it deserves a geopolitical monograph of its own, but a brief look provides a relevant glimpse at how geography played a role in turning Greek city-states into a superpower. The political geography of the period was vastly different from that of the present day. The Mediterranean Sea was the center of the world, one in which a handful of Greek city-states clutching the coast of the Aegean Sea could launch “colonial” expeditions across the Mediterranean. The rugged geography also afforded these city-states a terrain that favored defense and allowed them to defeat more powerful opponents. Nonetheless, the ancient Greek period is the last time that Greece had some semblance of political independence. It therefore offers insights into how Greek geography has crafted Greek strategy. From this ancient period, we note that control of the Aegean was of paramount importance, as it still is today. The Greeks — faced with nearly impassible terrain on the Peloponnesian Peninsula — were forced to become excellent mariners. Securing the Aegean was also crucial in repelling two major Persian invasions in antiquity, and each major land battle had its contemporary naval battle to sever Persian supply lines. Once the existential Persian threat was eliminated, Athens, the most powerful of the Greek city-states, launched an attempt to expand itself into an empire. This included establishing control of key Aegean islands. That imperial extension essentially ended with a long, drawn-out campaign to occupy and hold Sicily, which would have formed the basis of control of the entire eastern Mediterranean, and to wrestle Cyprus from Persian control. While the Athenians may have understood the geopolitics of the Mediterranean well, they did not have advanced bureaucratic and communications technology that makes running a country much easier in the modern age or the population with which to prosecute their plans. Athenian expeditions to Cyprus and Egypt were repulsed while Sicily became Athens’ endgame, causing dissent in the coalition of city-states that eventually brought about the end of Athenian power. This example only serves to illustrate how difficult it was to maintain control of mainland Greece. Athens settled for a loose confederation of city-states, which was not a sufficient basis of control on which to establish an empire. Bitter rivalries among the various Peloponnesian city-states created a power vacuum in the 4th century B.C. that was quickly filled by the Kingdom of Macedon. Despite its reputation as the most “backward” of the Greek regions — in terms of culture, system of government, philosophy and arts — Macedon had something that the city-states did not: the ample agricultural land of the Axios and Strimonas river valleys — ample, at least, compared to the Peloponnesian Peninsula. Whereas Athens and other city-states depended on seaborne trade to obtain grain from regions beyond the Turkish straits and the Black Sea, Macedon had domestic agriculture. It also had an absolute authoritarian system of government that allowed it to launch the first truly Greek-dominant foray into global power projection under Alexander the Great. This effort, however, could not be sustained. Ultimately, the estuary of Axios did not provide the necessary agricultural base to counter the rise of Rome, which was able to draw not only on the Tiber and Arno river valleys but also, in time, the large Po river valley. Rome first extended itself into the Greek domain by capturing the island of Corfu — illustrating the island’s importance as a point of invasion from the west — which had already fallen out of Greek hands in the 3rd century B.C. With Corfu secured, Rome had nothing standing between it and the Greek mainland, and through military campaigns ultimately secured control over all of Greece by 86 B.C. The fall of Greece to Rome essentially wiped Greece out of the annals of history as an independent entity for the next 2,000 years and destined mainland Greece and the Peloponnesian Peninsula to the backwater status it had under Byzantine and Ottoman rule (save for Thessaloniki, which remained a key port and trading city in the Ottoman Empire). While it may be tempting to include Byzantium in the discussion of Greek geopolitics, since its culture and language were essentially Greek, the Byzantine geography was much more approximate to that of the Ottoman Empire and later Turkey than that of Greece proper. The core of Byzantium was the Sea of Marmara, which Byzantium held onto against the encroaching Ottoman Turks until the mid-15th century. In the story of the Ottoman conquest of the Balkans, the territory of modern Greece is essentially an afterthought. It was the Ottoman advance through the Maritsa River valley that destroyed Bulgarian and Serbian kingdoms in the 14th century, allowing the Ottomans to then concentrate on consolidating the remaining Byzantine territories and conquering Constantinople in the mid-15th century after a brief interregnum caused by Mongol invasions of Anatolia. Greece proper was not conquered as much as it was abruptly severed from the rest of the Balkans — and therefore Christian Europe — by the Ottoman power that thoroughly dominated all the land and sea surrounding it. The ascent of the Ottoman Empire created a new political geography around Greece that made an independent and powerful Greece impossible. The Ottoman Empire was an impressive political entity that plugged up the Balkans by controlling the southern flanks of the Carpathians in present-day Romania and the central Balkan Mountains of present-day Serbia and Bulgaria. Greece, as part of the Ottoman Empire, was not vital for Ottoman defense or purse, although Greeks as people were valued as administrators and were assigned as such to various parts of the empire. Greece itself, however, had become an afterthought. If we had to pinpoint the exact time and place where political geography in southeastern Europe changed, we could look at Sept. 11, 1683, at around 5 p.m. on the battlefields near Vienna. It was here that Polish King Jan Sobieski III led what was, at the time, the largest cavalry charge in history against the Ottoman forces besieging Vienna. The result was not just a symbolic defeat for Istanbul but also a failure to plug the Vienna gap that the Danube and Morava (the Slovak, not Serbian Morava) rivers create between the Alps and the Carpathians. Holding the Vienna gap would have allowed the Ottomans to focus their military resources in defense of the empire at a geographical bottleneck — Vienna — freeing up resources to concentrate on developing the Balkan hinterland. The Pannonian plain, fertile and capital rich because of the Danube, would have added additional resources. The Ottoman Empire did not crumble immediately after its failure in Vienna, but its stranglehold on the Balkans slowly began to erode as two new powers — the Russian and Austro-Hungarian empires — rose to challenge it. Without the Vienna gap secured, the Ottoman Empire was left without natural boundaries to the northwest. From Vienna down to the confluence of the Danube and Sava, where present-day Belgrade is located, the Pannonian plain is borderless save for rivers. The mountainous Balkans provide some protection but are equally difficult for the Ottomans to control without the time and resources to concentrate on assimilating the region. The loss of Vienna, therefore, exposed portions of the Balkan Peninsula to Western (and, crucially, Russian) influence and interests as well as Western notions of nationalism, which began circulating throughout the Continent with great force following the French Revolution. First to turn against the Ottomans was Serbia in the early 19th century. The Greek struggle followed closely afterward. While initial Greek gains against the Ottomans in the 1820s were impressive, the Ottomans unleashed their Egyptian forces on Greece in 1826. The Europeans were at first resistant to help Christian Greece because the precedent set by the nationalist rebellion was equally unwelcome in multiethnic Russia and Austro-Hungary or the imperial United Kingdom. Ultimately, the Europeans had a greater fear that one of the three would move in and profit from the dissolution of the Ottoman Empire and gain access to the eastern Mediterranean. While Austro-Hungary and Russia had designs on the Balkans, more established European powers like the United Kingdom, France and (later in the 19th century) Germany wanted to limit any territorial gains by Vienna and St. Petersburg. This was vital for the United Kingdom, which did not want to allow the Russian Empire access to the Mediterranean. Since the end of its war against the Ottomans in 1832, Greece has been geopolitically vital for the West. First it was vital for the British, as a bulwark against great-power encroachment on the crumbling Ottoman hold in the Balkans. The United Kingdom retained a presence — at various periods and in various capacities — in Corfu, Crete and Cyprus. To this day, the United Kingdom still has military installations in Cyprus that are considered sovereign territory under direct British rule. Greece also became vital for the United States as part of the U.S. Soviet-containment strategy. To maintain influence in Greece, the United States intervened in the Greek Civil War (1946-1949), furnished the Greek merchant marine with ships after World War II, rushed Greece and Turkey into NATO in 1952 and continued to underwrite Greek defense outlays throughout the 20th century. Even a brief military junta in Greece, referred to as the “Rule of the Colonels” (1967-1974), did not affect Greek membership in NATO. Neither did Greece’s near-wars with fellow NATO member Turkey in 1964 (over Cyprus), in 1974 (over Cyprus again), in 1987 (over the Aegean Sea) and in 1996 (over an uninhabited island in the Aegean). The United Kingdom and later the United States were willing to underwrite Greek defense expenditures and provide Greece with sufficient capital to be a viable independent state and enjoy a near-Western standard of living. In exchange, Greece offered the West a key location from which to plug Russian and later Soviet penetration into the Mediterranean basin. Secure control of the Aegean to maintain defensive and communication lines with key mainland population centers. Establish control of Corfu, Crete and Rhodes to prevent invasions from the sea. Hold the Axios River valley and as far up the valley as possible for agricultural land and access to mainland Europe. Consolidate the hold on inland Greece by eliminating regional power centers and brigands, then collect taxes and concentrate capital in accordance with the needs of the state. Extend control to outer islands such as Cyprus and Sicily to dominate the eastern Mediterranean (this is an imperative that Greece has not accomplished since ancient times). With the collapse of the Soviet threat at the end of the Cold War and the subsequent end of the Balkan wars with the 1999 NATO bombing of Serbia, the political geography of the region changed once again. This time the change was unfavorable for Athens. With the West largely uninterested in the affairs of the region, Greece lost its status as a strategic ally. And along with that status, Athens lost the political and economic support that allowed it to overcome its capital deficiencies. Today, Greece cannot even dream of achieving its fifth geopolitical imperative, dominating the eastern Mediterranean. Even its fourth imperative, the consolidation of inland Greece, is in question, as illustrated by Greece’s inability to collect taxes. Nearly 25 percent of the Greek economy is in the so-called “shadow” sector, by far the highest rate among the world’s developed countries. Succeeding in maintaining control of the Aegean, Greece’s most important imperative, in the face of regional opposition is simply impossible without an outside patron. Going forward, the question for Greece is whether it will be able to accept its much-reduced geopolitical role. This, too, is out of its hands, depending as it does on the strategies that Turkey adopts. Turkey is a rising geopolitical power intent on spreading its influence in the Balkans, the Middle East and the Caucasus. The question is now whether Turkey will focus its intentions on the Aegean, or instead will be willing to make a deal with Greece in order to concentrate on other interests. Ultimately, Greece needs to find a way to become useful again to one or more great powers — unlikely, unless a great-power conflict returns to the Balkans — or to sue for lasting peace with Turkey and begin learning how to live within its geopolitical means. Either way, the next three years will be defining ones in Greek history. The joint 110 billion-euro bailout package from the International Monetary Fund and European Union comes with severe austerity strings attached, which are likely to destabilize the country to a significant degree. Grafted onto Greece’s regionalized social geography, vicious left-right split and history of political and social violence, the IMF-EU measures will further weaken the central government and undermine its control. An eventual default is almost assured by the level of government debt, which will soon be above 150 percent of GDP. It is only a question of when, not if, the Europeans pull the plug on Athens — which most likely will be at the first opportunity, when Greece does not present a systemic risk to the rest of Europe. At that point, without access to international capital or more bailout money, Greece could face a total collapse of political control and social violence not seen since the military junta of the 1970s. Greece, therefore, finds itself in a very unfamiliar situation. For the first time since the 1820s, it is truly alone.